Welcome to the Crystal Pond where the calm and still water reflects the purity of the Realm of the Fairies. 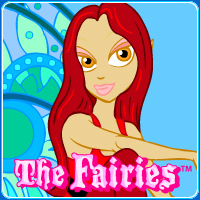 If you're lucky, your eyes may be blessed with the opportunity to see Lily the Pond Fairy. You can often see Lily the Pond Fairy relaxing on her favorite lily pad, looking at her beautiful reflection in the Crystal Pond. Her clothes are based on Lily's favorite colors, which are blue, green and red. Stories have been told that some people have seen Lily the Pond Fairy dancing and hopping from lily pad to lily pad reflecting the glow of the stars.